Streets of Washington, written by John DeFerrari, covers some of DC’s most interesting buildings and history. John is the author of Historic Restaurants of Washington, D.C.: Capital Eats, published by the History Press, Inc. and also the author of Lost Washington DC. It’s now a desolate patch of land–a parking garage over a buried stretch of Interstate 395 waiting to be redeveloped. 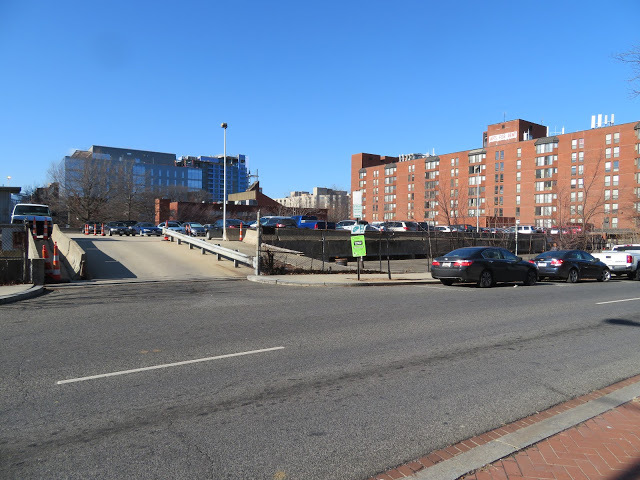 But the site at the northwest corner of 2nd and I Streets NW has an impressive history. Cresting a gentle hill, the view toward the Capitol from this spot once was commanding. This is where a stately row of three grand townhouses known as “Douglas Row” once stood. They were homes to senators, mayors, businessmen, Civil War generals, and even a U.S. president. 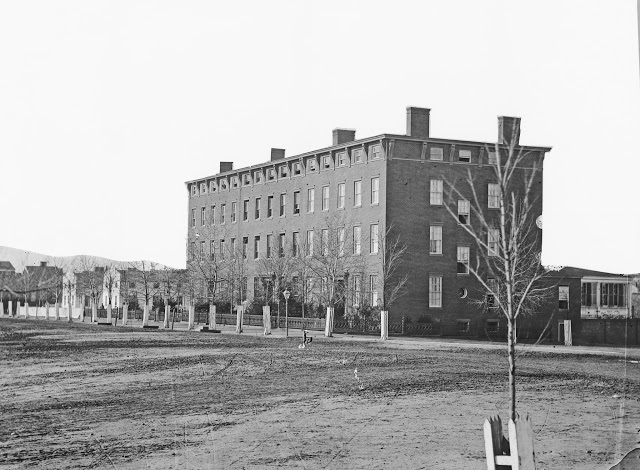 They also served as a hospital during the Civil War and as an orphan asylum. But as the neighborhood declined in the 20th century, the prestige vanished. Tourists once stopped and read historical markers on these buildings, but one by one they were demolished. Now, nothing is left to mark this site’s remarkable past. Late 1860s view of Douglas Row (author’s collection). The first settler in this area was a Captain Samuel Burch, a prominent early Washingtonian who built a country house nearby in 1812. The area was known as “Burch’s Hill” for much of the 19th century as a result. But little else was here until 1851, when Stephen A. Douglas (1813-1861), the Illinois senator and famous rival of Abraham Lincoln known as the “Little Giant,” purchased two blocks of undeveloped land–the block where Douglas Row would be built as well as the one on the other (south) side of I Street. Other than Burch’s house, few structures had been built in this area; the roads had not even been graded or clearly marked. Though just a few blocks north of Massachusetts Avenue, this was unmistakably “country.” At the time, Douglas was entering his second term as senator from Illinois, and he must have seen this hilltop as a perfect, bucolic location, just outside of the city, to build “a comfortable and convenient temporary residence for himself and his family during his service in the Senate,” as he later explained. Stephen A. Douglas, the “Little Giant” (Source: Library of Congress). Douglas built his first house, a “neat white cottage,” on the south side of I Street, but by 1857 his circumstances had changed. He had married the former Adele Cutts, a relative of Dolley Madison, and he decided he needed a much bigger house. He commissioned architect William Baldwin to design and build a row of three great mansions on the north side of I Street. Douglas would own and occupy the corner house, which would eventually be designated 201 I Street NW. An excerpt from the 1861 Boschke map of Washington, which shows in black all the built structures in the city at the time. The map is tilted; north is to the upper left. Note the White House in the bottom left corner, and the Capitol on the right side. 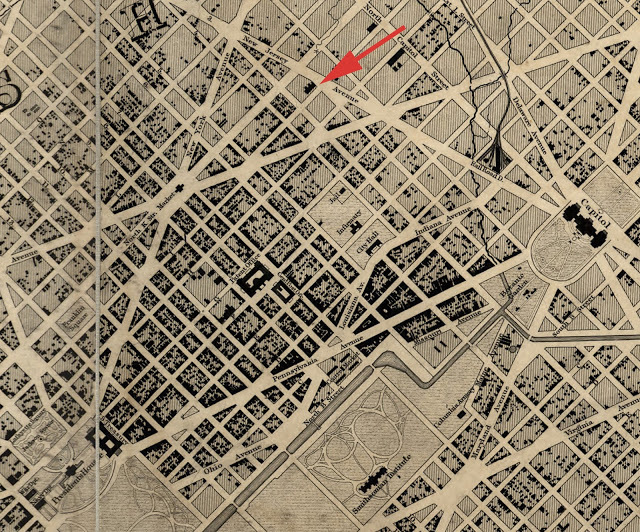 Douglas Row is marked by the red arrow. (Source: Library of Congress). Construction of the mansions was soon underway. In April 1857, The Evening Star observed: “The improvements in the neighborhood of Judge Douglas’s are being commenced in good earnest. The contract for building the houses (two) of the Hon. H. M. Rice and Hon. J.C. Breckinridge have been conditionally awarded to Mssrs. Baldwin and Bro at $15,000 each. They are to be 38 feet front, 50 feet deep, with rear wings and four stories high, with attic and basement storys.” The houses were said to be the largest of their type ever built in the city up to that time. They were grandly built, with 20 large rooms each, rich walnut paneling reaching to the high, frescoed ceilings in the parlors and dining rooms. The third house in the row, the future 205 I Street NW, was purchased by another congressman, Henry Mower Rice (1816-1894). Rice was a successful fur trader and so-called “moccasin Democrat” who had lobbied for creation of the Minnesota Territory in 1849. He served as a congressional delegate from the territory beginning in 1853 and was one of its first senators after it gained statehood in 1858. Douglas Row is sometimes referred to as Minnesota Row because of Rice’s involvement. Rice and his wife moved into his house by 1858. Meanwhile Stephen and Adele Douglas settled into their new corner mansion, which was dubbed “Mount Julep” after Douglas’s favorite cocktail and in recognition of the gracious dinners and levees the Douglases hosted there. In January 1858, the couple threw a spectacular housewarming party for hundreds of guests. Then, one Saturday evening in June 1860, a band from Illinois arrived outside the house and serenaded the Douglases with an impromptu, celebratory concert. The band had taken the train from the Democratic Convention in Baltimore and was there to inform Douglas that he had been nominated to be the party’s candidate for president. 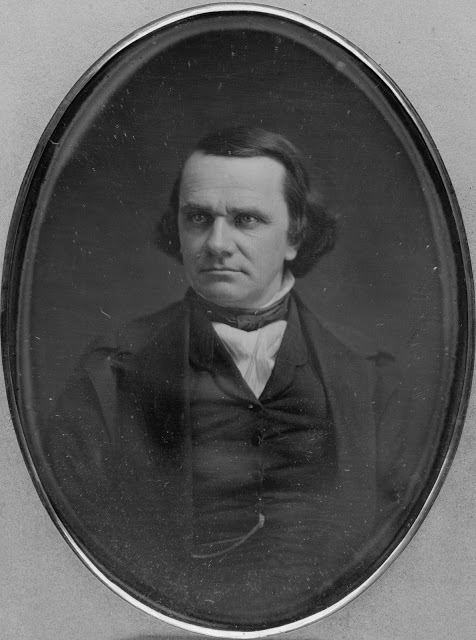 The Democratic Party had split over the issue of slavery, with Douglas, who bitterly opposed secession, being endorsed by the northern faction. John C. Breckenridge, who theoretically was Douglas’s next-door neighbor, was nominated by the southern faction, which had convened separately in Charleston. Breckenridge would end up sweeping the Southern vote. A May 1864 photo of Douglas Row (Source: Library of Congress). The onset of the Civil War in 1861 turned life upside down for Washingtonians, and the I Street mansions were in the middle of the fray. As northerners and military personnel swarmed in, Southerners and southern sympathizers fled. In November, the city’s only public hospital, the Washington Infirmary, burned to the ground, leaving the city with no public hospital facilities just as streams of wounded soldiers began arriving in town from the battlefields of Virginia and Maryland. Until it could build new hospital camps for the wounded, the army temporarily seized dozens of the city’s public buildings, including the Patent Office and 11 area churches, for use as hospitals. Just two blocks to the east of Douglas Row, the army sought to convert St. Aloysius Catholic Church to a temporary hospital, but parishioners built an adjacent frame building to use as a alternative so their church would not be taken. Meanwhile, Stephen Douglas had died suddenly from typhoid fever while visiting Chicago in June. His widow, Adele, moved out of the couple’s large mansion and offered it to the government to use for war purposes. Senator Rice did the same with his house, and the middle house was obtained as well. The whole row became Douglas Hospital. We are glad to learn that this forenoon the Government engaged the whole Minnesota row–the splendid mansions of the late Senator Douglas, Senator Rice, John C. Breckinridge, and Mr. Corbin–for military hospital purposes. Their cost of erection was about $130,000, exclusive of the value of the square on which they stand–perhaps thirty thousand dollars. The rent paid by the Government is at the rate of about seven thousand dollars per annum for the whole. All of them are bountifully supplied with heating apparatus, bathing rooms, aqueduct water, etc. They are the best buildings for the purpose, we take it, in the District of Columbia. Douglas and Stanton Hospitals (Source: Library of Congress). 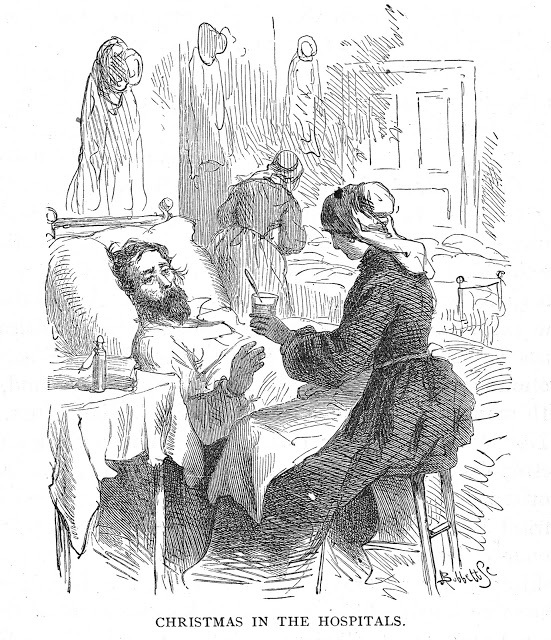 An illustration of a Washington army hospital scene, from Perley’s Reminiscences of Sixty Years in the National Metropolis (1886). 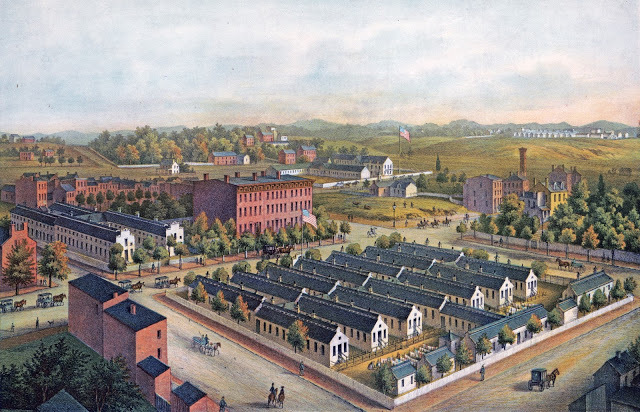 By that time a second temporary hospital, called Stanton Hospital after the Secretary of War, had opened in the large empty lot across I Street–land which had been owned by Stephen Douglas. In contrast to the elegant Douglas Hospital, Stanton was made up of rows of flimsy frame buildings that offered patients little more than basic shelter. As commonly happened to widows of that era, Adele Douglas faced financial hardship after the death of her husband, and Congress voted in 1862 to purchase Douglas Row, in large part to give her financial assistance. After the war, all of the city’s temporary hospitals were disbanded, and frame Stanton Hospital buildings were dismantled. Douglas Hospital closed in November 1865, rendering the I Street mansions surplus government property. Journalist Ben: Perley Poore, who always seemed to know what was going on behind the scenes in Washington, was the first to report at Christmastime in 1865 that supporters of war hero Ulysses S. Grant had purchased the old Rice mansion (on the western end) as a gift to the general for his military service to the nation. 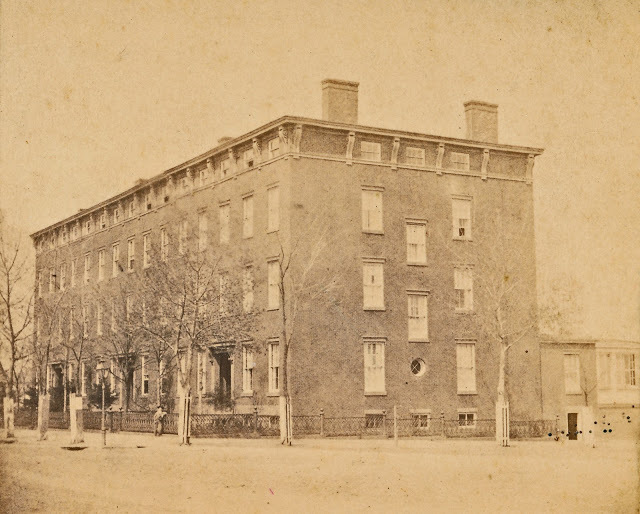 Grant moved into his new house in January 1866, ensuring that Douglas Row would once again rank as a prestigious Washington address. Grant lived with his family at the house until 1869, when he was elected president. His entourage left from this house on the morning of his inauguration. When Grant moved out, General William T. Sherman’s supporters purchased the house for him. Sherman lived there from 1869 to 1874, while he served as Grant’s commanding general of the army. Thus the Civil War’s two top Union generals both lived in a house that had previously served as a hospital for wounded soldiers who had served under them. Matthew G. Emery (1818-1901), the last mayor of Washington until home rule was restored in 1975, bought the house from General Sherman in 1874 and lived there until his death in 1901. Occupants of the other two houses included the Washington City Orphan Asylum, which was in the center building for several years while its main building was being used by the State Department, as well as another former mayor, Richard Wallach (1816-1881), who lived in the former Douglas mansion on the corner. Later, the Papal Legation was also headquartered in this mansion. Pioneering department store founder Gustav Lansburgh acquired the middle house in 1880 and lived there with his family for many years. Lansburgh and Emery were perhaps the last notable Washingtonians to live in Douglas Row. By the turn of the 20th century, the neighborhood was entering a steep and prolonged decline. For many years, wealthy Washingtonians had been fleeing the central part of the city for fashionable Dupont Circle and other rising neighborhoods to the northwest. 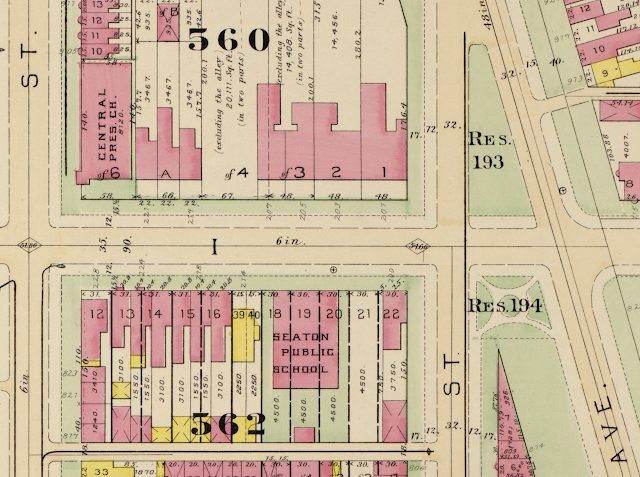 This excerpt from a 1903 real estate atlas shows the three mansions of Douglas Row (marked 3,2, and 1) as well as the Central Presbyterian Church at the other end of the block. (Source: Library of Congress). At the other end of the block–on the corner of 3rd and I Streets–the Central Presbyterian Church, a handsome Gothic Revival structure with a tall spire, had been built in 1873. President Woodrow Wilson briefly attended the Central Presbyterian Church after he was inaugurated in 1913, but he soon joined his all-white congregation in fleeing the neighborhood for a new building at 15th and Irving Streets NW in Columbia Heights. The old church was sold to an African American congregation, the Mount Carmel Baptist Church. Before the houses are rose bushes growing near the entrances and interwoven here and there with the iron fences before them. The three-story brick structures, with their extremely low attics, supplied with numerous windows, and snuggling beneath a flat, generously projecting roof, are disintegrating rapidly. Cracks, fast becoming fissures, appear in their walls, the window sills of gray stone are crumbling, and the clematis, ivy, and weeds, which abound in these once splendid gardens, are unable to hide the crumbling condition of the thick brick walls. A few years more and Douglas row will only be a memory. The fate of the abandoned mansion was sealed in 1950, when Safeway purchased 205 and 207, tore them down, and replaced them with a neighborhood grocery store. This left only the original Douglas mansion on the corner, which was still serving as a rooming house. But it too was doomed. In the mid 1950s, The Washington Post ran a series of sensational, racist articles about how deplorable the surrounding neighborhood was. The 200 block of I Street was just a block south of the 2nd Precinct, dubbed “Washington’s Wickedest” by the Post. “Rats and wretches, prostitutes and panderers, slayers and slashers, hopheads and “winos,” mingle and fight and die in the Second Precinct,” wrote the Post’s S.L. Fishbein. The notoriety led to plans to systematically raze the entire neighborhood, just as efforts were getting underway to do the same thing in Southwest. This was the be the Northwest Urban Renewal area, a complement to Southwest Urban Renewal. Soon this desire to erase poor black neighborhoods would combine with the simultaneous push for new highways, with the result that many of the blocks around I Street would be leveled. This stretch of the interstate was built in a deep trench so that future development could eventually cover it over. The current Capitol Crossing project is doing just that in the blocks south of Massachusetts Avenue. The 200 block of I Street was paved over much earlier, and a large apartment building was constructed a block to the north on K Street in 1985. A parking garage now fills the space where I Street once ran. The site of Douglas Row today, as seen from 2nd Street. The ramp to the parking lot is roughly where I Street once ran. (photo by the author). The block of I Street where the Douglas Row once stood is no longer even a street. The only thing remaining, at the opposite (western) end of the block, is Mount Carmel Baptist Church, at the corner of 3rd and I. In 1981, Mount Carmel replaced the 1873 Central Presbyterian Church that Wilson had attended with a modern red brick structure. Through the years since then, this and other churches nearby have worked to provide low-income housing for neighborhood residents, although their work is now threatened by gentrification. As glassy new condominiums spring up, virtually nothing remains to remind us of the neighborhood’s rich past. Sources for this article included Wilhelmus Bogart Bryan, A History of the National Capital from Its Foundation Through the Period of the Adoption of the Organic Act, Vol. 2 (1914); Douglas E. Evelyn and Paul Dickson, On This Spot: Pinpointing The Past in Washington, D.C. (2010); James M. Goode, Capital Losses: A Cultural History of Washington’s Destroyed Buildings (2003); James M. Goode, The Evolution of Washington, D.C.: Historical Selections from the Albert H. Small Washingtoniana Collection at the George Washington University (2015); Constance McLaughlin Green, Washington, A History of the Capital, 1800-1950 (1962); Wallace Mlyniec, Construction Notes: Transforming a Campus in Washington, D.C. (2006); Ben: Perley Poore, Perley’s Reminiscences of Sixty Years in the National Metropolis (1886); Hal H. Smith, “Historic Washington Homes,” In Records of the Columbia Historical Society, Vol. 11 (1908); and numerous newspaper articles.